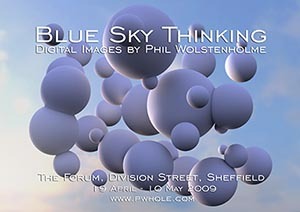 I'm pleased to announce a retrospective exhibition of a selection of my album cover work and other CG images, Blue Sky Thinking, at The Forum, Sheffield, which runs from April 19th - May 10th 2009. The exhibition is also included in the programme for Sensoria Festival, which runs from April 24th-29th 2009. It includes work created for Designers Republic, 808 State, Cabaret Voltaire, Strictly Rhythm, The Orb, Warp Records, and The Lovers, as well as a more recent commission for The Beat Is The Law film. Special thanks also to: Alex Liddle and Patti Crozier at The Forum, Nigel Humberstone and Jo WIngate at Sensoria, Rupert Wood at The Archipelago Works, Dave Robinson at SENTA, Jonathan Jesson at BIG, Eve and Richard Wood at Sheffield Vision, Steve Beckett at Warp Records, Carole Crane and Paula Shirley at Artezone, Ina Dufuss, Ian Anderson, Adam Morris, Richard H Kirk, The Lovers, Graham Massey.